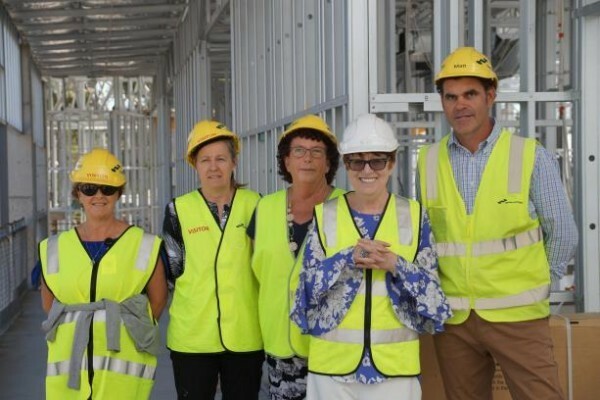 From left, Commissioning Team Leader Jacinta Munro, Executive Manager Care Services Sue Cahill, Commissioning Team Leader Sue Taylor, CEO Kerri Rivett and Hansen Yunken Project Manager Matthew Ledger. The new 120 bed, $34million building at Tarcoola to eventually replace Hakea Lodge will be known as Maculata Place. After much discussion and consultation, the Shepparton Villages Board decided on the name to represent the Maculata trees lining the entry to the building, and Place was chosen as the definition of home. The building is on track for completion in August this year, with current timelines suggesting that residents will be moved in at the end of September. As previously announced, residents of the existing Hakea building at Tarcoola will move in permanently to Maculata Place, along with residents from Grevillea House at Rodney Park in Mooroopna. Residents from Boronia House and Waratah Lodge in Mooroopna will move temporarily in to the old Hakea building once the current Hakea Lodge residents relocate and the building has had a bit of a lick of paint so that works on the $16.8m redevelopment of Rodney Park can begin. This is an extremely busy time for all, and our Commissioning Teams headed up by Sue Taylor and Jacinta Munro have been working on logistics and plans for quite some time to ensure all moves run smoothly. The residents in Hakea Lodge have been trialing chairs, tables and other furniture to determine suitability for the new building.